When we pressed them on their reasoning, we learned they aren’t unhappy with their webinar software because it is inadequate or because it no longer meets their needs in general. Rather, the problem stems from the unrealistic expectations they had for the software in the first place. When I spoke with customers and prospects about what they were looking for in a webinar solution, I realized they weren’t asking the right questions — questions that would help them identify their needs and choose a product that will work best for their business’s unique content plan. The underlying problem seems to be an overreliance on technology: The technology used should support content marketing best practices — not be the best practice. Marketers looking for a webinar software that does it all — with all the latest bells and whistles — may be in for a rude awakening. When pressed, most webinar software providers will admit that their products aren’t built to integrate with landing pages, or email and analytics tools. These are gaps that content marketers will need to fill in for themselves, so it’s critical that they are prepared to evaluate the benefits of a webinar solution based on its intended purpose: hosting webinars seamlessly and playing nice with a company’s overall digital infrastructure. Selecting a webinar solution has more to do with questions you need to ask about your business than questions you need to ask providers. The webinar software market is pretty mature, so there are likely many solutions available to meet your specific needs — if you have realistic expectations. The key is to look for solutions that conform to your best practices, not the other way around. In the end, it’s not the arrow, it’s the archer that hits the target. 1. Who is my audience? On his webinar registration/landing pages, my colleague, and webinar demand-generation expert, Mike Agron, includes an essential field: “What would you like to learn from this webinar?“ Mike’s question underscores what should be obvious: You are hosting webinars with the intention of engaging an audience, so the absolute first requirement for any webinar software is whether or not it has the features you need to reach and engage your particular audience. There is no one solution that does this better than all others because — you guessed it — every audience is a little bit different. For example, does your target audience skew towards older demographics? You may want a solution that doesn’t require users to have to download proprietary software and plug-ins in order to be able to tune into your webinars (even if those plug-ins enable extra-cool functionality). Is your core audience under the age of 25? You may want to make sure they can watch your webinar from a mobile device and that the solution you choose includes VOiP capabilities. No one is going to engage with your webinar content if they can’t easily attend — no matter how flashy your slides are or how much state-of-the-art, real-time functionality your solution provides. 2. When is my audience most likely to engage with my webinar content — on my schedule or theirs? : Odds are that your audience is almost as happy to watch a recorded webinar as the live version, so let me put it this way: Not having the ability to record your webinar and deliver it on-demand is like burning your college degree the day after graduation. Spending all that time to create something spectacular to only use it for an hour is a ballsy proposition. Suffice it to say I don’t understand companies that don’t allow customers to record their webinars. That being said, even when this functionality is available, you want to make sure you aren’t relying on your webinar software to provide you with a suite of sophisticated video editing tools. For a high-quality video, you’ll likely have to do the heavy lifting outside of your chosen solution (don’t listen to anyone who tells you otherwise). But you should ensure that your selected software at least gives you a standard quality recording that can be exported to universal formats and optimized using other tools. 3. Who will be presenting in my webinars? : Having guest presenters and an interwoven narrative is one of my favorite webinar techniques. Do you often have multiple speakers on a webinar, and if so, do you think you will need an admin console that enables you to seamlessly switch the view between different presenters and their slide decks? 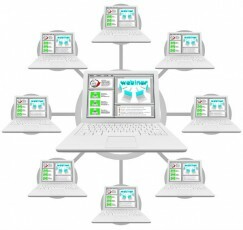 I find that this functionality often gets overlooked during trial periods when only “watered-down” webinars are tested. Don’t find out about limitations like this for the first time when you are ready to deliver a live webinar. 4. To what formats and platforms will I need viewer data exported? : Don’t let expansive charts and data sets fool you into overlooking a lack of standard integration capabilities. If you need data sent to your other marketing services (and you will almost always need this), then you must make sure your solution can at least export data in a .csv format, if a direct integration with your existing systems isn’t possible. Here’s a hint: If you find yourself running into the word “proprietary” too many times when exploring a webinar software product, my advice would be to look elsewhere. There’s no reason that, in a market with so many choices, you should get locked into a walled ecosystem. This bears repeating: Do not become dependent on a particular technology. Your best practices should always be achievable with a wide variety of software options. When you want to reference a tweet from your blog, do you send your audience off your site, or do you simply embed the tweet right in the blog? When you want to reference a slide deck on your blog, do you send your audience off your site or do you simply embed the deck right in the blog content? You do everything in your power to keep your audience engaged on your owned media properties, right? So why would you send visitors away from your site and toward third-party landing pages to access your webinar content if you don’t have to? My advice for all content marketers is to look for webinar software that includes built-in functionality or an API that will let you publish landing pages directly on your site. I can guarantee that “keeping visitors on my site” is one of your top best practices, so do not relinquish it with inadequate software. Instead, make sure you ask your IT managers how your marketing infrastructure is managed, and get the specs you will need to make sure you can integrate lead capture directly from your site. Once you’ve answered these five questions, you will find yourself in a much better position to objectively review various webinar software solutions and make a selection that you’ll be happy with over the long-term. Want more tips on selecting software solutions that will meet your content marketing needs? Read CMI’s guide on How to Choose Content Marketing Technology.